Built in Schenectady, NY, Big Boy was the name given to the Union Pacific Railroad's twenty-five 4000 class 4-8-8-4 articulated steam locomotives built between 1941 and 1944 by Alco. The Big Boys were the only locomotives to have the 4-8-8-4 wheel arrangement, combining two sets of eight driving wheels with both a four-wheel leading truck for stability entering curves and a four-wheel trailing truck to support the large firebox. 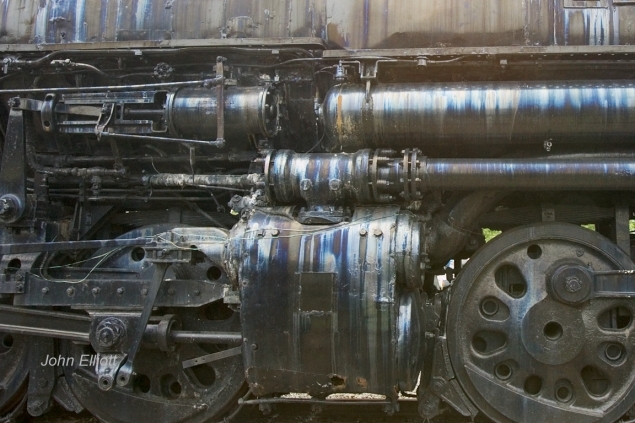 It's over 132 feet long and weighed 1,208,750 lbs, one of the largest successful locomotives in the world. This is one of two closeup views from the side.